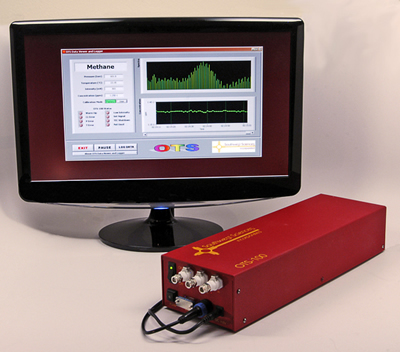 The OTS-100 is a diode laser-based analyzer for laboratory and industrial gas measurement applications and is available for several different small molecule gases. This affordable instrument is ideal for monitoring gas concentration at part-per-million sensitivities, or better, depending on the gas. This instrument is a self-contained analyzer for measuring trace amounts of a selected gas using diode laser optical absorption with wavelength modulation spectroscopy (wms) detection. The analyzer is fully automated upon power-up. A LabView-based program is supplied to read, display, and log gas concentration, temperature and pressure measurements, and instrument diagnostic codes on the user's computer. Readout is via a USB port configured for serial transmission and is available for user-customized data acquisition programs. The basic unit requires user-supplied sampling lines. An internal pump to flow the gas through the absorption cell is standard. If the sampled gas is also present in the background air, an additional port is provided so that the enclosure and path external to the absorption cell can be purged. In addition to this bench top analyzer, Southwest Sciences also makes rugged, specialized instruments for measuring gases in industrial, outdoor and airborne applications. To discuss special requirements, please contact Kris Peterson at (505) 984-1322 (info@swsciences.com). * Nitrogen purge required to measure concentrations less than 3 times the concentration in ambient air. ‡LDL is defined as the concentration for which S/N = 1. The concentration measurement range is gas dependent. Contact Southwest Sciences for the expected concentration range for a selected gas. Modifications to accommodate other gases, concentrations, or conditions may be possible. Please contact us regarding your needs. *Instrument is not rated for outdoor operation. **For	operation below 500 Torr, consult Southwest Sciences. Part number of the product. Your Purchase Order (PO) Number. The delivery address, billing address, your contact name & phone number. A quotation number (if applicable). Specify shipping method (paid by purchaser). If not specified, standard is UPS or FED-EX ground. Delivery time is 6 – 10 weeks for standard gases, depending on laser availability. The defects are called to the attention of SWS in writing within one year after the shipping date of the instrument, by email at sales@swsciences.com or by mail at Southwest Sciences Inc., 1570 Pacheco St., Suite E-11, Santa Fe, NM 87505. The instrument's case has not been opened nor has the instrument been adjusted, repaired, or altered by anyone who was not approved by SWS. The instrument was used in the normal, proper, and ordinary manner and has not been abused, altered, misused, neglected, involved in an accident or damaged by act of God or other casualty. The purchaser, whether it is a distributor or direct customer of SWS or a distributor's customer, packs and ships or delivers the instrument to SWS (at SWS's main office in Santa Fe, NM, USA) within 30 days after SWS has received written notice of the defect. Unless other arrangements have been made in writing, transportation to SWS is at customer expense. No-charge repair parts may be sent at SWS's sole discretion to the purchaser for installation by purchaser. SWS's liability is limited to repair or replace any part of the instrument without charge if SWS's examination determined that part to have been defective in material or workmanship. SWS will replace, with no labor charge, a laser that is still under the laser manufacturer’s warranty. Laser replacement parts and labor for a laser not covered by the laser manufacturer’s warranty will be at the purchaser’s expense. The laws of some locations may not allow the exclusion or limitation on implied warranties or on incidental or consequential damages, so the limitations herein may not apply directly. This warranty gives you specific legal rights, and you may already have other rights which vary from location to location. All warranties that apply, whether included by this contract or by law, are limited to the time period of this warranty which is a twelve-month period commencing from the date the instrument is shipped to a user who is a customer or eighteen months from the date of shipment to SWS authorized distributor, whichever is earlier. Further information concerning this warranty may be obtained by writing or telephoning Southwest Sciences, Inc.